The demand for rare Earth materials is growing much faster than production. Rare Earth metals do occur in the earth’s crust, but not in sufficiently high concentrations. This is why only one country — China — has so far been supplying the entire world with these elements. In recent years, however, China has begun to restrict its export of these materials. European research organizations have teamed up to address growing rare Earth materials by examining a more focused approach to recycling scrap. The entertainment industry understands the rare Earth crisis, why doesn’t everybody else? U.S. dependence on rare earths imports substantially exceeds our dependence on imported petroleum. In 2011, the United States imported 45 percent of the petroleum we consumed, but we imported 100 percent of the rare earth materials we consumed that same year — and rare earths are far more essential to a wider variety of industries than petroleum is. China controls the production, refining, and processing of over 95 percent of the world’s rare earth elements despite only controlling about half of the world’s rare earth resources. In the 1980s, there were approximately 25,000 American rare earth-related jobs; now we barely have 1,500. The United States must take action now to reduce our dependence on foreign sources of rare earth materials and bring back jobs. Researchers have identified nonductile concrete buildings constructed before roughly 1980 in the Los Angeles area. This category of buildings is known from experience in previous earthquakes to have the potential for catastrophic collapse during strong earthquakes. Nonductile concrete buildings were a prevalent construction type in seismically active zones of the United States before the enforcement of codes for ductile concrete which were introduced in the mid-1970s. A companion study estimates that approximately 17,000 nonductile reinforced concrete buildings are located in the most highly seismic areas of California. More than seventy-five million Americans in thirty-nine states live in towns and cities at risk for earthquake devastation. Using an approach akin to assembling a club sandwich at the nanoscale, researchers have succeeded in crafting a uniform, multi-walled carbon-nanotube-based coating that greatly reduces the flammability of foam commonly used in upholstered furniture and other soft furnishings. In tests, the flammability of the nanotube-coated polyurethane foam was reduced 35 percent compared with untreated foam. As important, the coating prevented melting and pooling of the foam, which generates additional flames that are a major contributor to the spread of fires. In the search for cheaper materials that mimic their purer, more expensive counterparts, researchers are abandoning hunches and intuition for theoretical models and pure computing power. In a new study, researchers used computational methods to identify dozens of platinum-group alloys that were previously unknown to science but could prove beneficial in a wide range of applications. One out of nine of the nation’s bridges is structurally deficient and that more than 30 percent of bridges have exceeded their 50-year design life; the average age of the nation’s bridges is currently forty-two years. Motorists in the United States make more than 200 million trips across bridges rated structurally deficient or in need of significant maintenance and yearly inspection. Of the more than 17,000 bridges in New York, 12.5 percent are structurally deficient and 27 percent are considered functionally obsolete. One major culprit for bridges’ deterioration: corrosion of reinforcing steel. New testing method could replace expensive, time-consuming visual inspections. When engineers attempt to make a building earthquake-resistant, they use specific structural components, appropriately called details, to absorb earthquake forces and help direct some of those forces back to the ground. That works, but when an earthquake hits, the entire building reacts, not just the sections containing details. Even though academic research has led to improvements to the original building codes over the decades, there is much to be learned about the entire system of a cold-formed steel building as it responds to an earthquake. What can the U.S. military learn from a common squid? A lot about how to hide from enemies, according to researchers. Researchers show that material that mimics calamari skin is invisible to infrared cameras, which is a good thing since infrared detection equipment is employed extensively by military forces for night vision, navigation, surveillance, and targeting. 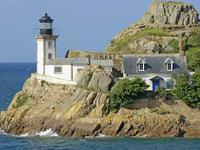 Lighthouses in Brittany, France, have stood at the intersection of violent currents, blinding storms, and breaking surf for over a century. A lighthouse turret off the coast of Lorient in Brittany has been enhanced with technology developed for bridges. 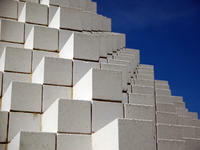 This trial run will test the application of Ultra-High Performance Concrete (UHPC). Adding limestone powder to “green” concrete mixtures — those containing substantial amounts of fly ash, a byproduct of coal-burning power plants — can significantly improve performance. The promising laboratory results suggest a path to increasing greatly the use of fly ash in concrete, leading to sizable reductions in greenhouse gas emissions, energy use, construction costs and landfill volumes. Currently, engineers can use single-point sensors or fiber optic strips to detect structural problems, but the devices can collect data over relatively small spaces. The problem is that many failures develop over large areas and cannot be detect that at an early stage. The 2007 collapse of a highway bridge in Minneapolis, for example, developed over a gusset plate with an area of several square meters, far too large for current monitoring systems to practically survey. Researchers have developed ultrathin radios which can be embedded directly on plastic sheets, which can be applied to walls and other structures. The innovation could be used for new devices ranging from an invisible communications system inside buildings to sophisticated, flexible structural health monitoring system for use on bridges, buildings, roads, pipelines, and other structures. U.S. Rare Earths, Inc. (UREE) the other day announced the results of its 2013 exploration in Lemhi Pass, Montana. The company says the results confirmed that its properties have the highest accessible rare earth deposit in North America. The rebuilding efforts following the devastation wreaked by Superstorm Sandy have triggered a discussion over preparedness and resiliency in America’s commercial and residential buildings.Some experts callfor a presidential appointment of a building resilience “’czar”’ with authority to coordinate and seek synergies between public and private sector initiatives. A Swedish architectural form is building a 34-story wood skyscraper in downtown Stockholm. Solid wood will be the predominant material in the building’s pillars and beams, while inside the apartments, walls, ceilings, fittings and window frames will be also constructed of wood.The firm says that wood is not only cheaper than either steel or concrete, but is also more fire resistant than both. This is due to 15 percent of wood mass being water, which will evaporate before the wood actually burns. In addition, logs get charred which protects the core. A team led by Johns Hopkins structural engineers is shaking up a building in the name of science and safety. Using massive moving platforms and an array of sensors and cameras, the researchers are trying to find out how well a two-story building made of cold-formed steel can stand up to a lab-generated Southern California quake.